Pat Gohn gave me the heads up today about a limited release movie about an abortion survivor: October Baby: Every Life is Beautiful. Find out more about it here: October Baby. It looks wonderful! Nominated five times as country music’s top male vocalist and author of more than a dozen chart-topping songs, Collin Raye has been a popular country performer for 20 years. Now he is putting his talents toward the cause of life, recently signing on as national spokesman for the Terri Schiavo Life & Hope Network, which seeks to raise awareness about euthanasia and the care of persons with disabilities. The network is run by Bobby Schindler, the brother of Terri; her feeding tube was removed by court order in 2005. Raye, 51, was born in Arkansas and grew up in Texas, first performing on stage with his mother at age 7. After performing for years with his brother, he began his solo recording career. He became a Catholic at age 23 and has recorded songs with strong faith themes. In April 2010 his granddaughter Haley, died at the age of 9 of a neurological disorder she was born with. On his most recent album, Raye performs a tribute to her, She’s With Me, in which he celebrates her life as filled with love and meaning though she needed constant care. Yeasts are funny things, fungi, really. They're not pretty, and some of them smell. Yet without these fermentation and leavening agents, we wouldn't have wine, beer or a host of baked goods. Yeasts begin small processed that spawn big results. It may not seem that visiting a sick friend or helping out at a food pantry or giving money to a charity can matter much. . . But just as Jesus' ministry began small and continues to inspire billions some 2000 years later, so can our actions make a difference in the lives of our family, friends and strangers. We don't have to be pretty or smell good. We just have to be open to being part of the process. In these days when fathers are unfortunately frequently absent from their children's lives, "Abba!! Abba!!" 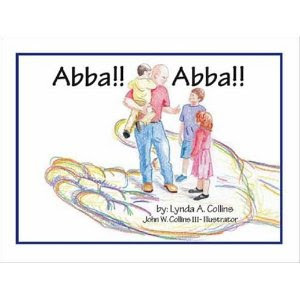 is a sweet children's book about a father's love - both our earthly father and our Father in heaven. A father takes his three children on an outing to the park where they get to see many animals bonding with their parents as well as have fun playing on the playground. When another boy falls and hurts himself badly, he calls out "Abba!!" and his father comes to help him. Later on, one of the children asks her own Daddy about it and her father explains that "Abba" is the Aramaic word for father and the term that Jesus used to call his own father when he was on the cross. He tells his children, "God the Almighty Father wants all His children to know that when we fall He is right there to comfort us and hold us in His loving arms." The book is illustrated by the author's brother-in-law, John Collins. Children will especially love the drawing of an ostrich peering out at them from the pages of the book! There is also great beauty in the image of God holding us in the palm of his hand. This would be a lovely book to read aloud with a child to help share with them the depth of our Father's love. We all feel tempted to quit sometimes. Whether they are related to relationships, parenting, or work, there are moments in life when we simply want to throw up our arms in frustration and give up. And, sometimes, we want to blame God. After all, God allowed circumstances to be so hard. Obviously, God doesn’t want us to accomplish whatever it is we are trying to accomplish. Otherwise, the road wouldn’t be so full of potholes and mountains. I recently had the pleasure of attending the premiere performance of “Present Company Excluded,” a play written by Doug Foresta. Based on the life of Herbert Roth, it tells of a young Jewish boy living in Roth, Germany in the years leading up to World War II. As Roth prepares for his Bar Mitzvah, he questions everything about God. Why doesn’t God talk to him the way he talked to Abraham? Why did God allow his mother to die? Why is God allowing his father’s business to fail and his friends to ignore him simply because they are Jewish? There is a great deal of truth to that statement. Indeed, it can be very difficult to discern what God wants from us in life. There are certainly times when it seems every door is being slammed against us. It seems that there is no point in continuing and that God must want us to take a different path. Sometimes, He does. But if that is the case, then the window will open. Other opportunities and circumstances will come our way. If we continue to pray, however, and trust that God is with us, and no other paths open up to us, then we have no reason to quit the road we are on. Yes, it may seem impossibly hard and the outcome uncertain, but we need to keep trying. We need to keep getting up every morning and do our best and leave the rest to God. God is the one ultimately in charge. I love the statement by Blessed Mother Teresa, “God doesn’t call us to be successful, only faithful.” Our success or failure is determined only by God. He has His reasons for having us on the road we are on. The roadblocks, too, are there for a reason. Although, often it is only in looking back that we can appreciate them. As Roth stated in the play, his mother dying led to his hated step-mother joining the family. She would be the person who would ultimately save all of their lives. God does work in mysterious ways. Yes, circumstances are hard. But, if we quit, we need to own it. If we stop trying, we can’t blame God and say that it is His fault that things didn’t work out. To find out more about "Present Company Excluded," please visit www.dramastudio.org. A Second Look . . Simple Ways Toward the Sacred, but I'm not sorry that I took the time to read it again. It has been well over three years since I last spent time with this book. My life is very different now. As a result, I brought a different perspective to its pages. Its reminders to focus on the simple things in life are always important, but perhaps never moreso than when we are crazy busy and there seems little time to breathe or appreciate much of everything. Life becomes a series of tasks before we succumb to sleep only to have to get up the next day and do it all again. 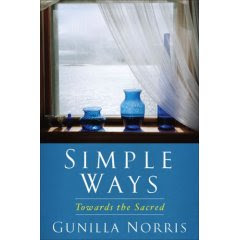 Gunilla Norris emphasizes the gift of our bodies, our senses, our dwelling places, and the objects that surround us. How much do we value these "simple" gifts? How often do we take them for granted? We can choose to be mindful. We can choose to appreciate. We can choose to be grateful to God for all of His gifts. These are the important messages contained in the pages of "Simple Ways Toward the Sacred." This week, I finished up working for Catholic Exchange, and am pleased to announce that I am now a Senior Editor with Catholic Lane. I hope that you will visit Catholic Lane and like us on Facebook. I'm very excited about this new chapter in my career! Food for the Poor is an organization I've started supporting this year. Of course, there are many people hungry in our own country that need help (I try to help with that cause as much as I can as well), but it is important to remember the people around the world who are dying of malnutrition, especially when you see how far just a few of our dollars can go. Book Review: "A Book of Saints for Catholic Moms"
There are many wonderful books about Catholic saints available. Most of you probably own some of them. Perhaps you even have some collecting dust in your home. They looked so interesting, but you never found the time to read them. So, why should you purchase another one? Because in the new “A Book of Saints for Catholic Moms,” Lisa Hendey has put together a very inspiring, practical guide to the saints designed especially for Catholic mothers. Hendey, the founder of CatholicMom.com, wrote this book as the follow-up to her best selling “The Handbook for Catholic Moms.” In that book, she focused on the “importance of nurturing ourselves as moms in four components of our lives: heart, mind, body, and soul.” In this resource, she has profiled 52 saints and highlighted which of those four components they speak to in our lives. This book can be used on a week by week basis with the focus being on one saint per week, or one may simply wish to focus on a saint that speaks to whatever area of one’s life is in need of a little extra help at the moment. 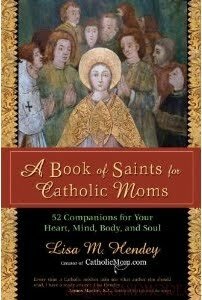 In “A Book of Saints for Catholic Moms,” Lisa Hendey has compiled and created a very useful and inspirational book. It can be used alone, with your family, or as part of a Catholic women’s book club. No matter how it is used, your life will be enriched as a result. What if Jesus was Sitting Right Next to You? This tip comes from one of my homeschooling friends. When her children want to watch something inappropriate, she asks them if they would watch it if Jesus was right next you. That's actually a good standard for all of us, don't you think? Where is the Joy in our Liturgy? I recently happened to be at my Church in the evening. I was there for a meeting with my children, but as we were leaving, the Spanish community was just beginning their weekly prayer service. The music was upbeat and full of energy and the people were singing and praising God with their whole bodies. They were full of joy! It was quite a different experience from the one we usually have at Mass. I half-jokingly told my children we may have to start attending the Spanish Mass! "The poverty among these Kenyans is matched, even exceeded, by the depth of their faith demonstrated at weekly Masses . . . In spite of liturgies that can last three hours or more, with many parishioners sitting outside under the hot sun . . .every moment of the Mass is filled with joy and reverence for God. 'They love to sing and dance . . . for them, it is truly a celebration." When we attend Mass, we have respect and prayerfulness (at least most of the time), but where is our joy when we celebrate the liturgy? Maybe we could learn something from these other traditions. You may find it difficult to believe that a highly functioning Roman Catholic priest would experience the tormenting loneliness of depression. After all, I presumably had faith, theological studies and God on my side. I'd written a number of books on the subject of emotional and spiritual health, been a traveling and radio and television preacher and was even, at one point, accepted into a doctoral program in psychology. Depression, however, shows no partiality. It's an equal opportunity disease that robs you of the very things you need for a meaningful life: love, friendship, self-worth, faith, work, God and the ability to enjoy the simple pleasures of everyday life. No one is immune to the mood disorder of depression. No one! Nobody! . . . I've traveled to madness and have not only survived the journey but have returned with enough sanity and graceful serenity to either help some to avoid having to take the trip there or to help them on the road back. Recently, in the question and answer segment of an online talk I was giving to a group of homeschooling mothers, a mom asked me how we can know when we are supposed to be “proactive” as opposed to “letting go and letting God”. . .
As I explained to that beautiful mother, there is a difference, and a fine line at that, between being “proactive” as in “steadfast and diligent and persistent in prayer and service” and “proactive” as in “trying to affect change and bring about a certain result”. The latter is not in our domain. Results belong to God and God alone. The former, however, is exactly where our hearts need to be and that is that we trust, pray, and persist with confidence, knowing that the Lord will meet our needs and that He will always manifest His goodness in our lives. What if there had been no Steve Jobs? October has long been considered a month especially devoted to the Rosary. October 7th is the Feast of Our Lady of the Rosary. Pope St. Pius V established this feast in 1573. The purpose was to thank God for the victory of Christians over the Turks at Lepanto—a victory attributed to the praying of the rosary. Pope Clement XI extended the feast to the universal Church in 1716. As the mother of a child with Aspergers, I do wonder about his future. Will he be able to have a job and be a productive member of society? He has a lot to offer, but he also has a lot of limitations. While we are working to help minimize those, my sense is that life will always be a struggle for him. You told us that your mission would continue after your death and that you would not forget us. Our Lord also granted you a great privilege, telling you to "Distribute graces as you will, to whom you will, and when you will." Relying on this, I ask your intercession for the graces I need, especially (mention your intentions). This is an important article for every Catholic woman to read: Just Show Up - We Are Called to Love. I pray and hope that that this woman's testimony is not the experience of every Catholic woman with breast cancer, but I've seen first hand how hurtful Catholic women can be to each other and I have no doubt that this happens all too often. We sometimes really need the reminder to be kind to each other. Dr. Norman should know. He faced incredible odds and, in the midst of them, developed a renewed faith in God and continued to trust in Him even when the whole world seemed stacked against him. In 1994, he was fresh out of chiropractor school, married, with a new baby, when he answered a classified ad in the local newspaper for a part-time chiropractor. The job seemed perfect – he could work around his private practice and he desperately needed the money. Unfortunately, he would ultimately find out that his employers were actually members of the Russian mafia. Despite his innocence of any wrongdoing, he would be arrested by 6 FBI agents in front of his then five-year old daughter and given a choice. He could plead guilty to Federal perjury and agree to lie to put others in prison in order to avoid prison time, or he could fight the trumped up charges and risk going to prison for ten years. He chose to fight. 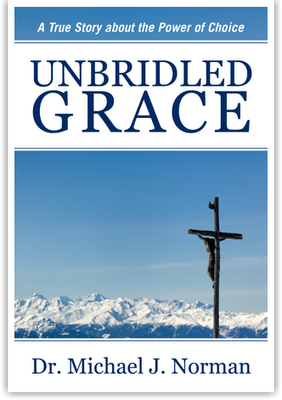 “Unbridled Grace” tells the story of that fight and the struggles and blessings that came along with it. The story itself is compelling – it could easily be a riveting movie, but that isn’t the best part of this book. Rather, it is the reflections at the end of the chapters in which Dr. Norman shares his hard-earned wisdom about life and faith that make this book worth your time. In the midst of his struggles, he rediscovered the Catholic faith of his youth, inspired by a Father John who took the time to meet with him regularly and guide him in his journey. Dr. Norman integrates elements of that renewed faith and his learning the art of submission into these instructional passages. He does not sugarcoat the teachings. He is a man who has suffered and knows that others suffer as well. He has experienced dryness in prayer and felt abandoned in the midst of his hurt. He also acknowledges the battle is never-ending this side of heaven. But he emphasizes that how we wage that battle has eternal ramifications. Our time here on this earth is short. We will have to answer for how we used that gift of time. 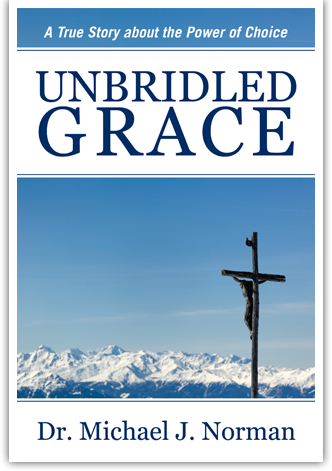 “Unbridled Grace” is a quick read, but with a tremendous message. One would never want to have walked in Dr. Norman’s shoes, but we can all recognize our own battles in his personal struggles. He shares much wisdom in these pages which can help us on our journey towards God. The answer lies in the Catholic belief in the Communion of Saints. We profess this every week when we say the Nicene Creed at Mass: “We believe in the Communion of Saints,” but what does that actually mean? It means that all of us – those in heaven, those in purgatory, and those of us struggling here on earth are all interconnected. Today is the feast of the Guardian Angels, which makes it the perfect day to say Thank You to them for all that they do for us. Personally, I'd like to thank them for protecting me and my children from two car accidents. Last week, a car swerved on the other side of the road and nearly hit me head-on and today, a small truck switched lanes and nearly crashed into me. Both times, I ended up scraping the curb, but escaped unhurt. Thank you, Guardian Angels! I'm glad you are there and I look forward to meeting you someday.